EnerSys is one of the world’s leading manufacturers of industrial batteries. Our development is future-focused. All of our products are manufactured by the latest production methods. We use our experience, skills and knowledge to advise, plan, set up the project and finally deliver the complete energy system. Whatever the need, whether for rolling stock or for standby applications, EnerSys can provide standard batteries or tailored solutions in accordance with local standards and designs. Rail technology is a significant part of the Product Development and Application Center, established by EnerSys near Basel, Switzerland. Our target is to assure customers, that with EnerSys energy solutions, the trains arrive safely and on time. Under our Hawker and Oerlikon brands we have vast experience in partnering European and International rail companies. EnerSys under Hawker brand offers complete battery systems comprising battery, battery container and corresponding charging technology to meet OEM performance specifications. Hawker EvoRail vehicle batteries, in accordance with the DIN standard, are fitted with maintenance-free, gel tubular-plate cells approved for application in railway vehicles. The battery trays are of polypropylene, polyethylene or plastic-coated steel and they are resistant to high mechanical stresses at different ambient temperatures. Because of their design the battery trays are particularly low maintenance and easy to handle and clean. The problem-free, cost-conscious cell replacement EvoRail battery does not require any water filling throughout its whole operational life. These batteries also eliminate the possibility of environmentally-damaging electrolyte leakage as the electrolyte is fixed in the gel. As a result, the batteries do not experience any faults. EvoRail batteries experience very little self-discharge. Suitable for medium, partly cyclical loads, these batteries have robust cell construction in a tubular-plate design. They are compatible as spare batteries for train lighting and diesel start. The fully-insulated maintenance-free fastening technology used in the EvoRail batteries ensures problem-free, cost-conscious cell replacement. Hawker PerfectRail vehicle batteries in crate design, in accordance with the DIN standard, are fitted with low-maintenance, low-antimony tubular-plate cells approved for application in railway vehicles. The battery connections ensure problem-free and easy battery replacement. Hawker’s automatic water refill system ensures that the batteries are low-maintenance, while the flexible connectors with adapted cross section allow the batteries to carry high currents. The cells and batteries have been homologated by many of the European rail organisations. Hawker PerfectRail range includes also low maintenance batteries for engine starting. PerfectRail proven Pb-sb and hybrid Pb-Ca grid technology offers a cost-effective and reliable battery, which you can depend on for consistent performance, irrespective on the application and environment. 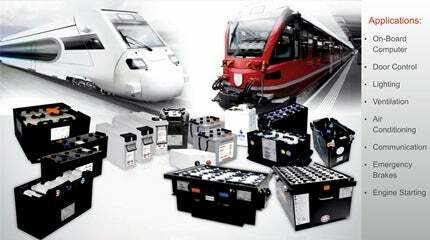 ZeMaRail VRLA/AGM/Gel are maintenance-free rolling stock batteries with Gel instead of liquid electrolyte. The main effect of GEL electrolyte in AGM-technology is the higher cycle performance and the deep discharge resistance. An additional side effect of GEL electrolyte in AGM-technology is the more efficient heat management. The hydrogen recombination is equal (up to 98%) than at a standard AGM type (GEL with rigid separator has less). Those batteries are certificated by Swiss Federal Railways. The certification of includes: cycling, deep discharge, shock and fire protection requirements for the entire battery system including the tray. ZeMaRail VRLA/TPPL+Sn are maintenance-free rolling stock batteries with Thin Plate Pure Lead (TPPL) technology. TPPL+Sn technology packs more power into the same space as a conventional battery and till now only EnerSys can deliver such batteries. Due to the purity of the materials used in construction corrosion and water losses are reduced, storage and service life is extended moreover resistance to abusive deep discharges is increased. Hawker supplies battery chargers for rail batteries. Battery charging profiles, adapted to the benchmark battery values set by Hawker, must be provided for maintenance-free EvoRail batteries to obtain an optimum operational life. Hawker recommends a temperature-controlled charging characteristic for all battery systems. Our series of high frequency chargers offers the best advantages for genuine adaptation of the various battery series for the maintenance in charging rooms. EnerSys is the global leader in stored energy solutions for industrial applications with the leading market share positions in North America and Europe and fast growing ones in Asia and the Middle East. Hawker PerfectRail batteries in crate design, in accordance with the DIN standard, are fitted with low-maintenance, low-antimony tubular-plate cells approved for application in railway vehicles. The battery connections ensure problem-free and easy battery replacement. Hawker PerfectRail proven Pb-sb and hybrid Pb-Ca grid technology offers a cost effective and reliable battery, which you can depend on for consistent performance, irrespective on the application and environment. Hawker ZeMaRail VRLA/AGM/Gel are maintenance-free rolling stock batteries with Gel instead of liquid electrolyte. The main effect of GEL electrolyte in AGM-technology is the higher cycle performance and deep discharge resistance. An additional side effect of GEL electrolyte in AGM-technology is the more efficient heat management. Hawker ZeMaRail Diesel Starting batteries combine excellent starting power and massive deep cycle reserve power in one battery, which you can rely on.